Over time, your spinal vertebrae and cartilage between these vertebrae can start to wear down, resulting in back pain and discomfort as you age. If you are a senior who experiences back pain, you don't have to resort to a sedentary lifestyle. Instead, you can perform gentle exercises to maintain flexibility and strength in your spine. Always speak to your physician, however, before beginning an exercise program to ensure you are not at risk for back injury. 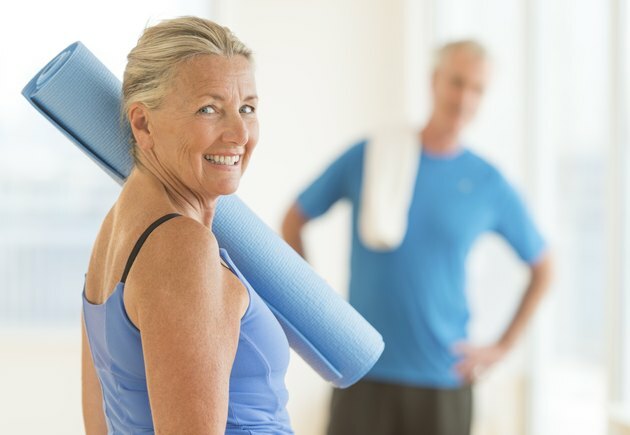 Maintaining a flexible spine is important as you age because it helps you maintain range of motion. Because you are at an increased risk for injury as you age, you do not have to perform severe twisting stretches. Instead, you can stretch the back via a pelvic tilt, which can be performed even if you are bed-bound. Lie on your back with your feet flat on the floor. Gently tilt your pelvis in toward your chest, but do not lift your mid-back off the floor. Hold this position to feel a stretch in your lower back. Strength and stabilization exercises help you strengthen the lower back, which can reduce your pain level. Always check with your physician before performing strengthening exercises. A stabilization exercise example includes sitting on an exercise ball with your knees flat on the floor. Slowly raise one arm overhead, then lower this arm and repeat on the opposite side. Continue alternating until you have completed five repetitions on each side. If you are more advanced, you can lift one leg in the air at a time. Strengthening the muscles in your legs helps you prevent tension in your lower back because these muscles pull on your lower spine. Examples of leg- and back-strengthening exercises include sitting on the floor with your feet extended in front of you. Slowly lift your leg off the floor, about three inches off the ground. Return your leg to your starting position, then repeat 10 times. Then, repeat on the opposite leg. Another exercise involves starting from a standing position with your hands on a sturdy piece of furniture for balance. Slowly bend your knee, bringing it to no higher than hip level. Slowly lower and repeat 10 times on this side, then repeat on the opposite side. Your abdominals are part of your core muscles, which also include your lower back. By strengthening your abdominals, you can provide stability and make it easier for you to perform activities like getting out of bed or your chair. One exercise example is the curl up. Lie on your back with your feet flat on the floor. Contract your abdominal muscles to slowly lift your shoulders and head off the floor. Do not go higher than is comfortable. Slowly lower your shoulders to the ground and repeat the exercise eight to 10 times, depending on your abdominal strength.